For years, t-shirts have been the mainstay for wearing your love of piracy on your sleeve (or more generally, your chest), while also dressing in acceptably modern fashion. But Seawolf Clothing has now taken a different tack with their run of “Caribbean Shirts.” And just what is a Caribbean Shirt? 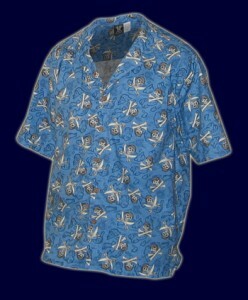 Think Hawiian shirt, but for (you guessed it) Pirates! Seawolf Caribbean Shirts are available in two colors, each with its own pirate-based pattern (each focusing heavily on skull&bones, but with different accent art.) For the purpose of this review I selected the blue shirt, which features smaller monotone jolly rogers against a backdrop of carribean charts. It makes for a more subtle look that does the black shirt, which features larger, more colorful jolly rogers and various pirate phrases all around (booty! captain! pirate!) Which shirt to choose would depend on the personality of the wearer, combined with just how overtly piratey they wish to be. Upon handling, my shirt was surpringly soft, yet also thick and durable feeling. The shirts appearance itself was as expected with its pirate pattern, but closer inspection revealed two surprising details. First, the buttons – rather than plastic – are actually carved from coconut, and read “seawolf.” And second, the pattern of the shirt blends perfectly with the pattern of the chest pocket, with each image and line of the shirt transfering seamlessly. It’s small details like these that can make or break a quality garment, and the Seawolf Caribbean shirts easily meet or surpass any expectations. The one caution I would offer would be regarding sizing. With most t-shirts I comfortably wear a large. However, I was literally swimming in a large Caribbean Shirt, and so opted instead for a medium. The medium is a much better fit, although a small may have been even better. In short, they run big. And being as patterned shirts of this sort are anything but slimming I’d suggest that if you’re on the fence between sizes, err small. I love the ability to dress in piratey splendor while also dressing “normal,” and Seawolf Caribbean shirts fit well into that mindset. If you’re likely to attend any luaus or other Hawiian-shirt-appropriate events in the near future, one of these shirts would be a fine piratey alternative to the more typical flowery sissy prints. This entry was posted in Clothing and tagged modern pirate fashion, sea wolf clothing, shirt by Bilgemunky. Bookmark the permalink. We are looking for some nice tropical clothing, we run a rum shack, or rum shop, on the tropical island of St. Lucia called Skeeterz Rum Bar – kind of a more upscaled version of the local rum shop. Please keep us in mind if you ever offer more variety – http://www.SkeeterzRumBar.com – please contact us anytime!